Description: Q595 rolls past the signal at Bakers. Description: A renumbered YN2 SD70MAC visits the BN today, along with a newer GEVO. Description: Lt.engine move from Vulcan at Raleigh street. 13:00 hrs. Description: K855 sits in the siding at Cario waiting to get a spot in the Lima yard. Description: K855 creeps into the east siding at the north end of Cario. Title: Potash in the siding. 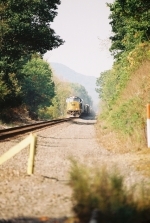 Description: CSX Q164 heads east through Scipio. 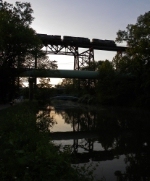 Description: CSX K170 glides across Marcy Trestle in the fading sunlight. Description: Seldom caught in nice morning light at Philadelphia is Tropicana Juice train Q740, eastbound across the ex PRR high line. Description: Great trailing unit on Tropicana Juice train Q740. Description: So how CSX 834 and CSX 4507 got here and i didnt know it. I dont have time close the car door but oh well. Description: Eastbound re-routed intermodal . Description: With the signaling system destroyed, a westbound stack running on a form D approaches a washout.